Seminar paper from the year 2010 in the subject English Language and Literature Studies - Literature, grade: 2,0, Christian-Albrechts-University of Kiel (Englisches Seminar), language: English, abstract: Though there was a movement since 1890 that began to break with previous norms, Modernism refers to the modern period from 1910 to 1945. The year 1913 is referred to as the beginning of the age of modernism when the Amory Show took place in New York in March 1913. It was the first large exhibition that showed modern art in the U.S., which was radical art in contrast to American standards. The time of modernism brought about the development of new inventions like radio broadcasting, the rise of motion pictures, mass production and the spread of consumerism, automobiles and aviation. Due to these inventions, the economic, social and political conditions changed and also literature was affected by these changes of society. Modernism as a literary movement caused a fundamental break with traditional modes of western art, concerning religion, social conventions and morality. It is an artistic movement that was characterized by its 'sense of engagement with ideas of the 'new'' (Armstrong 2005, 24). 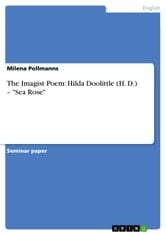 This term paper deals with the Imagist movement that came into being in 1912, and which is part of the modernist movement. 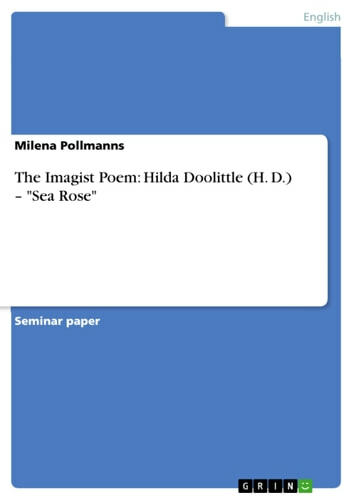 The term paper further deals with Hilda Doolittle's place within the Imagist movement and her poem Sea Rose.